Gestational diabetes is a condition in which women without previously diagnosed diabetes exhibit high blood glucose levels during pregnancy. It is an often complicated and intimidating condition to deal with, and requires following a strict diet plan to ensure the safety of both mother and child. Uncontrolled gestational diabetes can put a mother at risk for a myriad of complications including pre clampsia, jaundice, low blood sugar, and delivery complications. Some babies born to mothers with unchecked gestational diabetes can grow larger than a normal baby and cause complications for both mother and baby during delivery. A controlled diet is often the first step to controlling gestational diabetes. Every pregnant woman should follow certain guidelines when eating for two, but for women with gestational diabetes it is especially important to follow a healthy dietary plan. Most doctors will recommend eating three moderately sized meals per day with two or three snacks dispersed throughout the day. Meals should include whole grains, fresh fruits, lean proteins, and lots of vegetables. Carbohydrates will need to be heavily monitored and limited. Carbohydrates are not just limited to baked goods, though. A lot of foods are high in carbohydrates such as breads, cereals, pasta, potatoes, fruit, and milk. For pregnant women with gestational diabetes, it is a good idea to plan out your meals ahead of time. This will help you keep on track with what you are eating, and also ensure that you do not skip meals or snacks. Skipping a meal or snack can be detrimental to keeping your blood glucose levels in check. Whole grains such as steel cut oatmeal, bran cereal, or two slices of whole wheat toast. A protein such as a hard boiled or scrambled egg, or a tablespoon of peanut butter. A small handful of fresh berries or half a grapefruit. Example: One cup of hot bran cereal topped with a small handful of fresh berries and vanilla almond milk. Snacks should be mostly protein based. Try to stay away from chips or cookies. Example: A handful of raw almonds or six saltine crackers with a tablespoon of peanut butter. One ounce of protein and lots of fresh veggies make a delicious, satisfying, and gestational diabetic friendly lunch. Example: Tossed salad with one ounce of grilled chicken and two tablespoons of low fat dressing. Fresh cut veggies make a great healthy and filling snack. Three ounces of a lean protein of your choice, ½ to one cup of starch, and as many vegetables as you can eat. You can include a small amount of fat, such as one tablespoon of margarine or two tablespoons of a low fat salad dressing. Example: Three ounce turkey breast with bread crumbs served with half a cup of cooked quinoa with mushrooms and mixed vegetables sautéed in one tablespoon of olive oil. Try a baked apple with oats and cinnamon for dessert. It is highly recommended for expectant mothers to eat a before bed snack. It will help keep your blood glucose levels maintained while you are sleeping, and can sometimes help prevent morning sickness. Example: One slice of whole wheat bread topped with a sliced hard-boiled egg. Eating for two with gestational diabetes can be filling and enjoyable. By following recommended meal plans, you can ensure a healthy mom and baby. 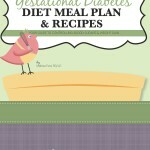 For a Complete Meal Planning with Gestational Diabetes Click Here! Suggested Reading and Meal Planning Book Below!